The Red Threat strikes again? After losing the general elections that took place last week, the Socialist party seems determined to get the hold of power through unnatural coalitions with other left-wing parties. If you’re from the North of Europe this won’t sound that obnoxious. After all, countries such as Denmark or Finland have been governed by grand coalitions including parties from the left to the right. Except for one relevant detail. 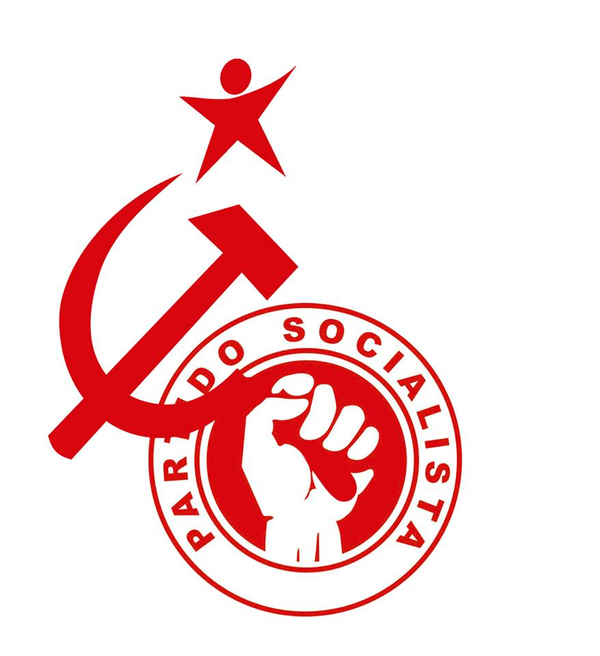 The coalition the Socialist party is proposing involves a trotskyist and a marxist-leninist party that have been very blunt regarding the role of Portugal in the Euro and in the European Union: out. 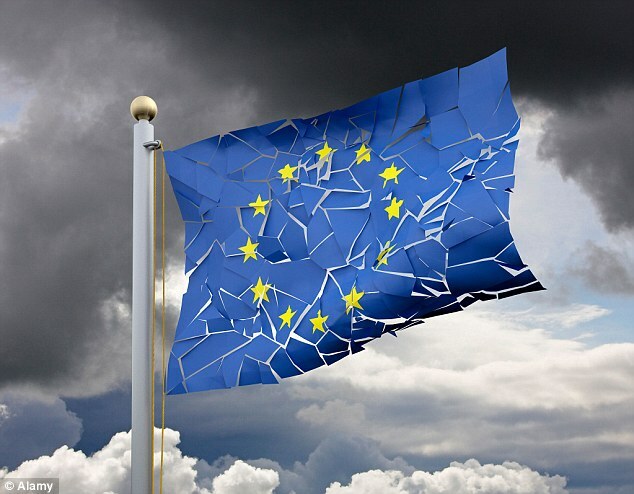 Now, even if they drop these radical proposals, thereby reducing the ideological distance to the Socialist party (which, after all, endorsed joining the EU and Euro), there will still be consequences. As part of the bargaining that is taking place, they may well demand disastrous conditions for giving the green light, possibly generating turmoil in the markets or in any reasonable person for that matter, at least one who remembers the outcome of radical left-wing experiments. There is plenty of reason to worry. It takes a lot of time to push important reforms, and it took significant effort from the Portuguese people to put their public finances back in shape again. And all it takes, as Greece has witnessed, is a couple of months to throw it all away. This could well do it. 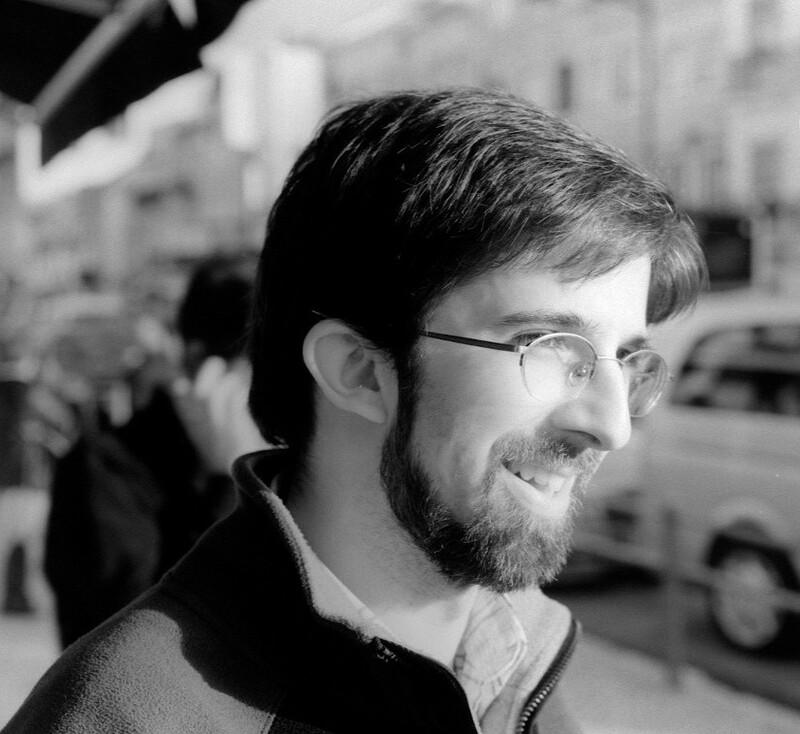 The country’s democracy has entered a vicious circle of which it will be immensely difficult to get out: as more and more regular voters mistrust politicians of any party, the more those politicians depend on the support of those groups that are opposed to the very measures that could help out the rest of the population, thereby provoking higher levels of dissatisfaction with the work of politicians, making them increasingly dependent on the support of those who vote for them no matter what or are a part of their particular clienteles, further marginalizing everyone else, and so on and so on, forever and ever. The coming election won’t just likely end up in a hung parliament. It will also signal how Portugal is facing a severe – if slow-burning – political crisis, in which the country itself, not just its Parliament, will be left hanging out to dry. After so many hardships, battles and fighting that Ulysses [Odisseu to our greek friends] had to endure while returning from the War of Troia, the most challenging one was resisting the enchantments of the Sirens. The Sirens were charming women that allured the crews, attracting their boats to the cliffs and rocks so as to wreck the ships — the calls of the Sirens were nothing but fantasies, albeit their consequences were real. The tragedy now taking place in Greece is an obnoxious remake, in an Italian neorealistic style, of Homero’s epic poems. Drained of all energy and exhausted, as were the sailors returning home from the battle, the Greeks gave in to the Sirens. They surrendered to demagogy and populism. They conceded to the false promises of an end to austerity. They succumbed to an utopian future requiring no effort and no sacrifice, no stoicism their ancestors once so proudly embraced. Only the Europeans taxpayers money, with no conditions or obligations whatsoever — or so go the chants of Syriza’s Sirens. And the boat has sunk. In less than 6 months, Greece has shifted from a steady situation, although modest, of a growing GDP and primary surpluses to economic and social chaos. Hundreds of pensioners lining up in front of closed banks. Capital controls, if not fleeing. Wages and pensions in risk of not being paid. An economy stalled by uncertainty. Tsipras & Co. have shown the bad can still get ugly. As the Greek crise unfolds, its the resolution that will leave a mark in the European project, but in a way opposite to what has been suggested so far. It’s Greece staying in the Eurozone, and not the other way around, that would open a dangerous precedent, creating a moral hazard. In particular, it would prove that a populist approach, false promises and breaking the rules of a common project are effective negotiation tools. Having opened the Pandora box, what would prevent the other Eurozone countries from adopting a similar stance whenever a given rule is not in their particular interest? If you can question the keystones of the European project, what would prevent Podemos or the National Front from raising them? It is by staying in the Eurozone, and not by leaving, that the European project is ought to be severely damaged. Although I’m not particularly fond of a Grexit, I reckon its imperative. Greece should exit the Eurozone in order for the European project, in all its dimensions, to stay afloat. An exit may be convenient to all parties. It suits the remaining Euro members, in this way closing the door to a terrible precedent that would give legitimacy to positions of clash. But it befits Greece in particular, as more importantly than money and a debt relief, they are in need of an extensive economic reform plan that could help them regain competitiveness, in this way putting an end to debt-addiction. Unfortunately, it is politically easier to get some of that competitiveness back by cutting wages and pensions through inflation and currency devaluation other than through tough political reforms. It is easier to maintain budget deficits by printing money, monetizing them. It is easier to lower prices (relative to other countries) through currency devaluation instead of promoting structural reforms that help companies become more efficient. It is easier to keep the vices, the clientelism, the chaos and the false promises than to get rid of them. Such proposals are nothing but a concealed form of austerity on steroids, making it harder to protect the most vulnerable. However, they are easier to accept, especially when the Greeks have fallen to the tunes of the protonationalist tale of «it is us against them». Another Siren song that has never ceased to play the trick on the populations. History repeats itself. Not by misfortune but rather by oversight. 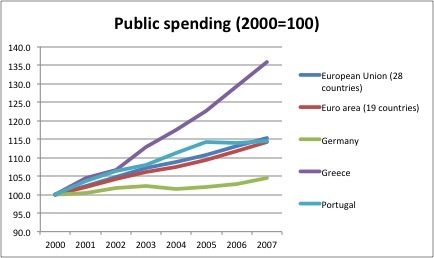 Greece joined the Eurozone in 2001. From that moment, it had an amazing growth. 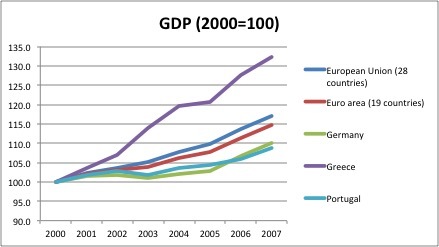 While other countries, like Portugal, went through a “lost decade”, Greece saw its GDP grow by 32% in 7 years. In the same perio, Portugal’s GDP grew by 9% and Germany’s a little more than 11%. With this GDP growth came a tremendous growth in wages. 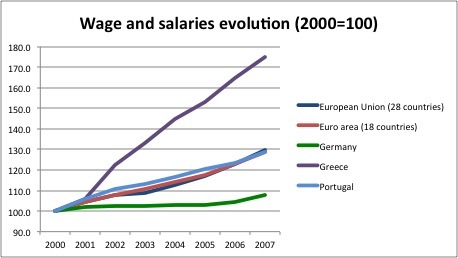 Between 2000 and 2007, wages and salaries grew by an astonishing 75%, almost triple the growth in Portugal and 10 times more than Germany. With the salary growth, greeks increased their standards of living. 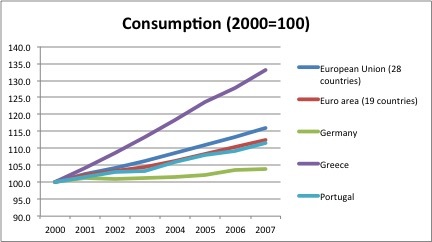 In these 7 years, consumption grew by 33%, while in Germany it stagnated and in Portugal it grew by a third. How was this increase in standards of living possible? There was no technological revolution in Greece, there was no influx of international investment like in Ireland and no natural resources were found in the Mediterranean. This was achieved thanks only to an extraordinary increase in public debt, a big portion of it masked in the official accounts. It was like Portugal, but on steroids. So, we are in 2008, the Greeks had increased their standards of living like never before. But that increase in standard of living had only been achieved thank to a significant economic distortion. 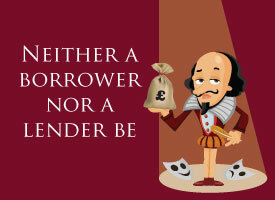 That high standard of living was only possible as long as there was someone available to loan the money required to keep it. A big part of the economy only existed thanks to the high level of public spending fueled by external debt. When the state would stop being able to fund itself, that share of the economy would simply disappear. That is what happened in 2008-09. After the noisy fall-out of Banco Espírito Santo, the largest private bank at the time, another bank is near insolvency in Portugal. This time is Banco Montepio, the banking holding of a mutual savings organization. The claim is made by an expert in banking insolvencies: João Rendeiro, the founder and ex-chairman of BPP, a small bank that has also been liquidated back in 2010. According to João Rendeiro, the bank needs more than a billion euros capital injection that the mutual savings organization’s member are incapable, or unwilling, to provide. The Portuguese Central Bank has already requested a change in the top management of the bank. The proposed new leader of the bank is no one less but the finance minister that led the country in the years before 2011 bankruptcy and requested Troika’s support.